With summer in full swing and back to school recess around the corner, kids everywhere will be headed to playgrounds to swing and slide to their heart’s content. Unfortunately, playground time can also mean injury time. Over 67% of injuries occur from faulty playground equipment or a fall. Each year 200,000 children are treated in the ER for playground injuries in the U.S. That equates to 547 injuries per day and 1 child every 3 minutes. And over 75% of public playgrounds and 91% of home playgrounds lack a proper protective surface and 45% result in a severe injury such as a fracture or concussion. These statistics are staggering but it’s important to share the message so that people can make the appropriate changes that are essential to keeping children safe. The folks at Rubber Mulch have put together these leading safety tips for playground safety that includes what to inspect on the playground, the correct length of the soft surface under the swings, basic ideas for safety and more. 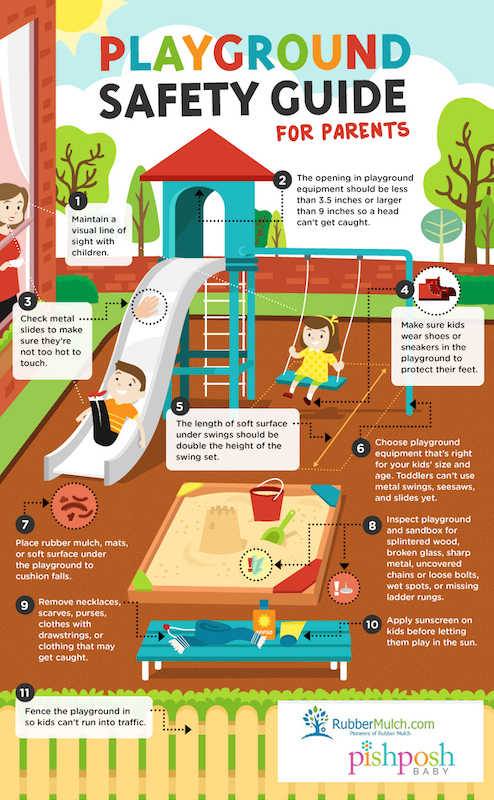 The following tips will help you plan the perfect playground for plenty of fun filled days with your little one. •Maintain a visual line of sight with children. •The opening in playground equipment should be less than 3.5 inches or larger than 9 inches so a head cannot get caught. •Check metal slides to make sure they’re not too hot to the touch. 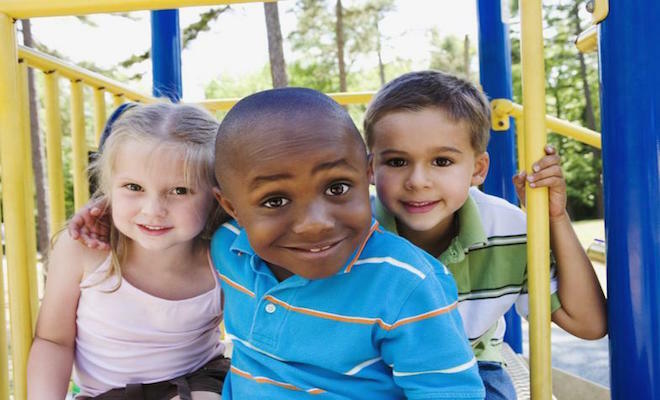 •Make sure kids wear shoes or sneakers in the playground to protect their feet. •The length of soft surface under swings should be double the height of the swing set. •Choose equipment that’s right for your kids’ size and age—toddlers cannot use metal swings seesaws or slides yet. •Place rubber mulch, mats or soft surface under the playground to cushion falls—it’s best to avoid playgrounds with a concrete surface. •Inspect the playground and sandbox for splintered wood, broken glass, sharp metals, uncovered chains or loose bolts, wet spots or missing ladder rungs. •Remove necklaces, scarves, and handbags, clothes with drawstrings or clothing that may get caught. •Apply sunscreen on the kids before letting them play in the sun. •Fence the playground in so kids can’t run into traffic. Miriam Sonenschein is the marketing coordinator at RubberMulch and a mom of four active kids She’s all too familiar with the myriad of safety concerns and potential hazards on the playground turf and provides expert advice about playground safety. Since 1997, Rubber Mulch (http://www.rubbermulch.com) has manufactured top quality rubber surfacing products for playgrounds, residences and commercial markets. Playsafer Rubber Mulch was handpicked by First Lady Michelle Obama for the White House playground due to their stellar reputation for superior safety, quality and service. Rubber Mulch pioneered the tire recycling industry with the most advanced technology and equipment to process scrap tires.